Who doesn’t like no-bake cookies?? I mean c’mon! 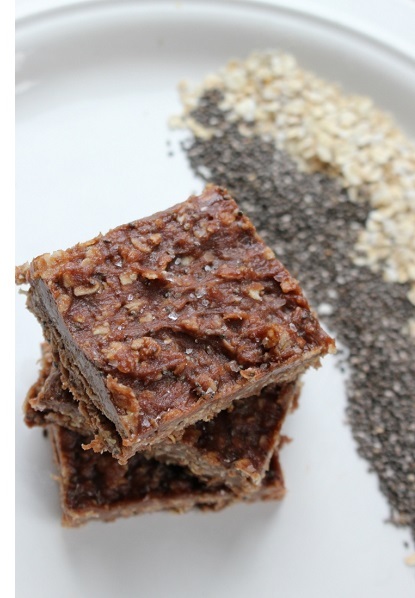 I came up with these Cocoa Peanut Butter Sea Salt Bars this past weekend and I’m obsessed! I’m a sucker for anything with that sweet and salty taste right now. This recipe has all of my favorites from oats and chia seeds to peanut butter and of course my CardioWhey. Let’s talk about how to find a “natural” peanut butter today. When looking for nut butter you always want to look at your ingredient list first. The ingredients should be VERY minimal! My brand of choice only has peanuts and less than 1% salt. Most kinds of peanut butter, even ones that say they are natural, have added sugars and fats that are unnecessary. I like my patients to focus on whole foods and minimal ingredients to ensure they are sticking to more quality foods. This sweet and salty combo is sure to make your tummy thank you! bowl. Microwave for 1 minute, stopping and stirring every 15 seconds. Once combined well, mix in dry ingredients of CardioWhey, oats, and chia seeds. In an 8 x 8 dish, put down parchment paper and then press bar mixture into dish until evenly spread. Grind up sea salt over the top of the spread out mixture. Place in freezer for at least 1 hour before cutting into 12 bars and serving. Store in freezer or fridge up to one week!